I’ve been told that if you want to boil a frog (you would have to be pretty hungry to try this) that you must first put him in cool water, and slowly turn the heat up. You see, if you put the frog in hot water, it will jump out when if feels the heat. If you start with cool water and slowly turn up the heat, the change in temperature is gradual, and therefore, the frog doesn’t realize what is happening until it is too late!! I have found that many of us are suffering this same fate. It happens like this. One day you wake up, and you can’t believe how bad your health has become. You feel and possibly look much older than you are. You are unable to enjoy life the way God intended. Medications don’t seem to work as well as they did when you first started taking them. Hobbies, sports, work, and family activities are not as enjoyable as they once were because you don’t have the energy, or it is too painful to do them anymore. You feel as if you are aging at warp speed. You don’t understand how you got into this mess. This is the “Boiled Frog Syndrome.”—the heat was turned up, and you didn’t even notice. Health, whether good or bad is a process, not an event. When we stop doing the things that are good for us, or we are overwhelmed by physical, chemical, or emotional stresses, we begin to lose optimal function. Over time this leads to poor health and eventually symptoms. You can’t develop symptoms or abnormal physiology until after you have lost your health! This process takes time, unless the body is subjected to a large trauma (car accidents, falls, sports injuries, etc.). Most of the people I work with fall into the “Boiled Frog Syndrome.” They tell me that they have either felt bad for a long time or performed some minor/repetitive activity such as: bending over to pick up a pencil, folding laundry, making the bed, vacuuming the carpet, or using the computer. Good health or bad health is a process, not an event. Many of us in the United States have become pill poppers. This is due to the fact that pills/drugs/medications will typically cover up symptoms quickly. This “quick fix” mentality comes at a high cost, both physically and financially. 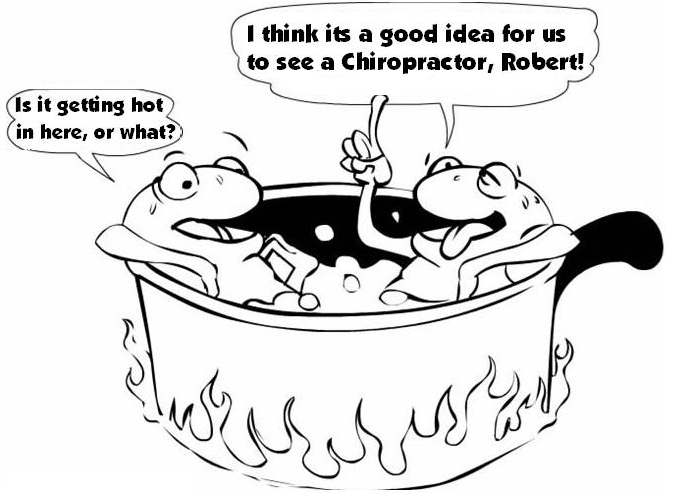 Covering up symptoms without correcting the underlying cause allows the problem to get worse, leading us to the “Boiled Frog Syndrome”, and thus, declining health. The worse our health becomes, the longer it takes to get it back, and the more it costs us in life enjoyment. I would encourage you to continue or begin your Western Loudoun Chiropractic corrective or wellness care plan and continue other healthy activities such as: exercise, proper nutrition, stress reduction techniques, and quality rest. A healthy lifestyle should still continue even after you feel better. Symptoms will often go away long before the spine is fully corrected. The choices you make today will affect the quality of your life tomorrow.